If you are looking for information on the Baker Brothers American Deli franchise business opportunity, Baker Brothers franchises or Baker Brothers Deli franchising, then you have come to the right place. Long before there was a Baker Bros. American Deli, there was a Baker family. Born and bred in the great Midwest, brothers Tom and Ken Baker were raised to appreciate the value of an honest days work and a good meal in return. And in the Baker home, hearty, honest foods were always served in generous portions and made true to original family recipes handed down through the generations. Today, those same Baker Brothers bring the authentic taste of the heartland to your neighborhood. As you'd expect, they insist on serving just baked breads, the freshest product and only premium quality meats and cheeses. As their guest, you'll find a variety that satisfies both appetite and curiosity. 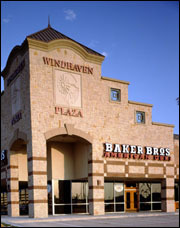 Baker Bros offers an extensive Franchise Support Program. Tom and Ken are always available to assist you and to answer any questions that you might have. In addition, one of our Franchise Advisors will come to your store periodically to provide personal assistance from Baker Bros. Whatever you might need, there will always be a person at Baker Bros who can help you. We offer off-site operations training at our Greenville Avenue Training Center in Dallas, Texas. Our Training Team will travel to your locations and provide on-site training to assure your Grand Openings go as smoothly and successful as possible. Baker Bros will help you with your store level marketing, advertising and promotions. We will assist you with all aspects of site selection, planning, construction and finishing out your stores. Baker Bros provides several comprehensive manuals to help you with a variety of franchise activities. Operations Manual - Vital information on operating your facility. Marketing Manual - Guidelines for graphic standards, easy-to-use logo materials, ad samples and step-by-step local store marketing. Design and Development Package - A detailed view of all design elements, furniture and equipment, plus a recommended seating plan and full set of prototypical drawings. Real Estate Assistance - Covers real estate criteria and site review. Using this detailed project management program, Baker Bros helps franchisees open their new units efficiently.